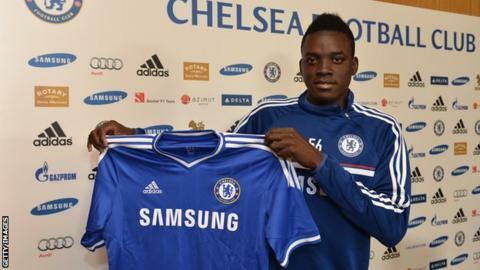 Chelsea allegedly face the threat of a two-year transfer ban following a Fifa investigation into their signing of foreign under-18 players, including former striker Bertrand Traore. Based on documents from Football Leaks, French website Mediapart claims 19 Chelsea signings have been looked at in a three year-long investigation. Mediapart alleges that 14 of those signings were under the age of 18. In a statement, Chelsea said it had "fully co-operated with Fifa". The club also said it had "provided comprehensive evidence demonstrating its compliance with the applicable Fifa regulations". According to Mediapart, Fifa's integrity and compliance unit has recommended Chelsea are handed a transfer ban covering four transfer windows, as well as a fine of £45,000. "The proceedings are ongoing and, to date, no decision has been passed by the Fifa judicial bodies," football's world governing body Fifa said in a statement. Mediapart claims Fifa found evidence that Chelsea had misled them over the dates, while Traore was found to have made 25 appearances for the Blues (under-16, under-18 and first team) despite not being registered by the Football Association. Chelsea have also admitted they paid his mother £155,000, as well as a further £13,000 to the club she chaired - AJE Bobo-Dioulasso - in April 2011 to allow them first refusal over his signature. That deal, it is alleged, was for four-and-a-half years, despite the limit for under-18s being only three years. Should they be handed a transfer ban, Chelsea will be the latest club to receive such punishment after similar incidences in La Liga. Real Madrid and Atletico Madrid have both previously received bans for breaching rules over the signing of minors in early 2016, while Barcelona were given a 14-month ban after breaking rules for signing international under-18s in 2014. Fifa is staying silent on this one, to the extent it is not completely clear whether it has concluded its investigation or not. A two-year transfer ban has been rumoured but a source with knowledge of the case has told the BBC they are not aware of that being mentioned as part of the punishment. Fifa has been looking at other clubs too, so, while Chelsea are in the eye of the storm at the moment, it is highly likely they will not be alone when the final outcomes are being determined.